My full name is Karl-Friedrich Lenz. I am a German player living in Tokyo. I have reached a 6d* rank on IGS, but am not playing much Internet games lately, since I prefer having the other player directly in view. When I lived in Germany until 1995, I liked the fact that there were always strong players available on the Internet. In Japan, however, there is no shortage of strong opponents even in my local club. However, since April 2004 I have played some games on KGS. My name there is kflenz http://kgs.kiseido.com/ja_JP/graphPage.jsp?user=kflenz. I have written some articles for Deutsche Go-Zeitung. I have just posted a book (in German, only pdf-file) http://k.lenz.name/d/v/ about several fundamentals of Go theory, with a chapter about copyright questions related to Go. I have a blog http://k.lenz.name/LB where I discuss mainly copyright and patent law. This post from April 2003 gives some preliminary thoughts on copyright protection for game records: http://k.lenz.name/LB/archives/000240.html#000240. The diagram below is a symmetric position, so it can actually happen if black plays the first move on Tengen and then mirrors all of white's moves mechanically. That might happen if a much weaker player takes black without handicap and relies on this strategy to keep the stronger player from winning. This doesn't work very well in this case, since it is white's turn now. 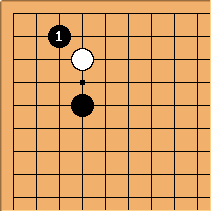 So this diagram might come up as one result of countering Mirror Go. Here is another diagram with a move I wrote about in Deutsche Go-Zeitung over twenty years ago. I have played it several hundred times and got a different result in many games. I think that it has quite a lot of variations, some of which I have been writing about lately. OK, I will start to write a few lines about the Go and copyright question here as well. 1. What problems are out there? There are quite a lot of different questions to consider. 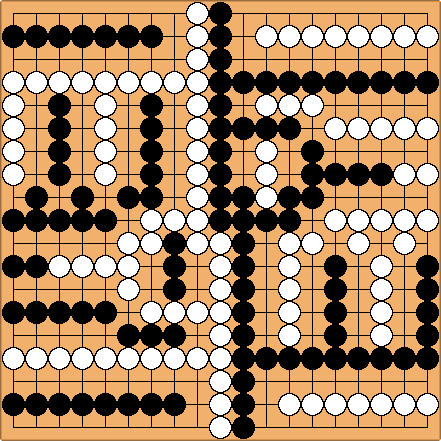 Works that might qualify for copyright protection are: Game records, new Joseki variations, tsume-Go (life and death) positions (with the two possibilities of those that came up in a real game and those that were composed by a player), variations on the Go rules creating new games like in the case of three-dimensional chess where an American court recognized copyright protection in the board and the rulebook, computer Go programs, Go databases, collectively edited Wiki pages on Go, books or comics on Go. 2. What law is relevant? There are international treaties on copyright, but copyright is always based on a national law, e.g. Japanese or German law. Since the economic value of Go related publishing is much higher in Japan than in Europe, I will start the analysis with what Japanese law says on the above questions. 3. What easy cases are there? One is that of the term of protection, which is 50 years after the death of the author in Japanese law, as opposed to 70 years in Europe and America. Since Go has a long history, that leaves quite a lot of game records etc. etc. in the public domain even if you assume a very far-reaching copyright protection. Another one is that of books like Kawabata's "Master of Go" or comics like "Hikaru no Go". The fact that they are about Go doesn't change anything in their copyright status. They are protected in exactly the same way as other books or comics. Still another easy case is that of Go playing computer programs. Computer programs are protected by copyright in most jurisdictions, including Japan, Europe and America. The fact that the particular program is designed to play Go doesn't change anything. That might also the only case where the General Public License applies to a work in relation to Go, the GNU Go program. 4. DougRidgway I like your submarine attack. Can I try it in my next game, or do I need to get a license first? That depends. If it is a private game, you can use the move already for the same reason you are allowed to make a video copy of a television program, e.g. the fair use exception for private copying that most copyright laws provide for. If on the other hand you are playing the game on a Internet server accessible by the public, or if you are a professional player and your game will be in some newspaper the next day, that exception might not help and you might be reduced to arguing that there is no copyright protection for new moves in the first place. That question is somewhat difficult. I would object to having no protection at all for new moves, which would make it legal for people to lift 50+ diagrams from my coming book on this move and republish them without a license, or without giving credit. That might go slightly too far. On the other hand, using a move in a game might be no act of copying at all. There is a difference between using a move in one of your games and writing about it in one of your publications. The above is a preliminary and abridged answer. I hope to be able to come back to a more detailed discussion some time later. However, even if one takes the rather extreme view that a license is necessary to use new moves in a game, you don't need to get a license first, since you already got one. By publishing the diagram above here, I have licensed it already under the Open Content License that applies to all content on this website, see SL Copyright. You are most welcome. This is indeed an interesting point. I will try to add some thoughts. You already have a license (the Open Content License), but that might be not enough considering the obligations in Section 2. If you are a professional player and the game will be published, then in most cases the copyright in the game would be sold in advance to the Nihon Kiin or some other organization sponsoring the tournament. Those rightholders would most certainly object to having the game under a Open Content License just because you used one move in a diagram published here. So, yes, the Open Content License probably doesn't help, and a Creative Commons license wouldn't do either, because it has the same viral effect on derivative works. That probably means you are reduced to arguing that using a new move in a game is no act of copying or of creating a derivative work in the first place. This is in line with the current practice and would still allow me to object to someone copying my diagrams in a book. Again, thanks for the interesting question pointing this out. PetriP? On what law to apply. That is also an huge issue. Under Finnish law game record is not protected by a copyright law. A compilation could be and commentary is for sure. Even if some Japanese newspaper/organizations thinks that game record is protected has no implications to me as long as do the copying in Finland i.e. publish the game record in a web-server residing in Finland. If you wanna see some "polite" discussion" about such an issue in sweden between american attourneys and swedish torren site operator you could see Legal secton of the pirate bay torrent search engine. Here is a link http://snipurl.com/5349 to a short post to rec.games.go on the copyright issue I wrote in 1998.
axd: Hello, sorry for intruding; this smells like deserving a place deeper in SL, some page in phpwiki:?search=copyright for example?